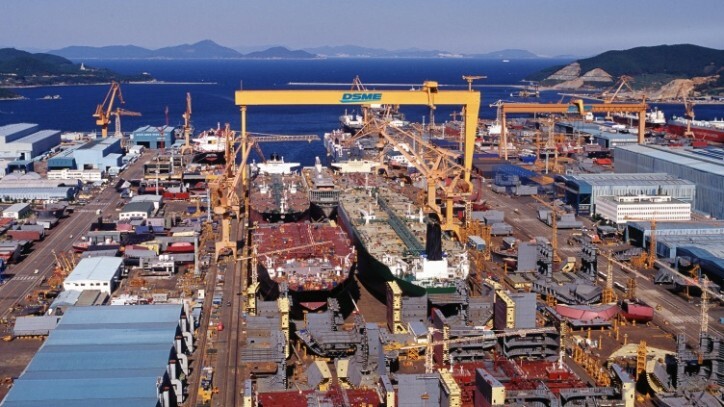 On Tuesday, Daewoo Shipbuilding & Marine Engineering (DSME) commented that its restructuring plan is going to emphasize on selling some noncore assets rather than on reduction of the company’s workforce. The possible job cut rumors began circulating over the weekend following an announcement by DSME CEO Jun Sung-leep in regard to a restructuring program aimed at cutting costs, which would include manpower relocation and job rotation. Due to the global drop in shipbuilding, the shipyard has sustained a serious reduction of its income and expectations are for it to post an operating loss of approximately 3 trillion won (USD 2.6 billion) in Q2. There are ongoing investigations as the company is suspected of concealing a cumulative loss of roughly 2 trillion won (USD 1.72 billion) from its respective balance sheet for 2014. The largest shareholder in DSME, the government-run Korean Development Bank (KDB), which has a share of 31.46%, announced its decision on Sunday to initiate a large-scale debt restructuring process. DSME’s biggest creditor that is The Export Import Bank Of Korea has commented that it is going to support KDB’s efforts of securing liquidity for the shipyard. Neglecting its financial woes, this week DSME managed to acquire an order for an all new LNG carrier vessel. Greek-based Chandris ordered a 173,400 cubic meter LNG carrier following a previous order that was scheduled in December of last year. In 2014, out of a total of 66 orders for LNG carriers, DSME was able to acquire 37 of them.